Ever since the three new teams, Manor, Campos and USF1, were selected to enter F1 next year there has been trouble bubbling behind the scenes. Now it has boiled over. Writing in the Telegraph, Pitpass' business editor Chris Sylt reveals that one of the rejected teams has blown the lid on the selection process by complaining to the European Commission that the FIA allegedly told them they had to use engines built by Cosworth. Pitpass was the first F1 website to report on these allegations of unfairness when the story first broke three weeks ago and the latest development brings things to a head for fans since it puts a question mark over whether the three new teams will make it to the sport next year. If the EC launches an investigation and finds that the allegations of bias are true then the selection process and the selected teams will almost certainly be declared invalid. The biggest surprise for some may be the identity of the team making the complaint. This is Serbian engineering company AMCO which intended to enter F1 next year under the brand Stefan Grand Prix, named after its chief executive Zoran Stefanovic. 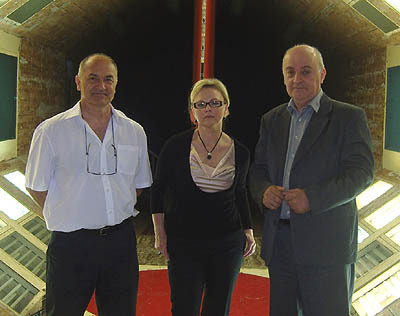 Stefanovic - pictured on the right above in the team's Belgrade windtunnel - was not widely-known to have put in a bid for 2010 with his name previously coming into F1 circles when he attempted to buy the Lola team's cars after the team went under in 1997. Stefanovic may have stayed off the radar before the 2010 selection but he is certainly not staying that way. His explosive letter of complaint to the EC, which has been seen by Pitpass, says "AMCO Corporation was forced by the FIA to sign with Cosworth and AMCO is complaining because of that...There is an element of plot behind our back which we are not capable of getting rid of without the Directorate General for Competition." AMCO originally planned to use an engine from one of F1's current suppliers and Stefanovic says he "even considered going with our own engine." He claims he was "forced to sign with Cosworth, even though we had two different options better for us...we were forced into a contract without our will, just to be 'eligible' for selection." Nevertheless, Stefanovic eventually agreed to use Cosworth but his application was rejected. He has now officially complained to the EC in a bid to get the selection process carried out again. "AMCO wants the FIA 2010 selection process for new teams to be reviewed in an anti-trust investigation and declared 'automatically void' by the Directorate General for Competition of the European Commission," says Stefanovic's letter of complaint. He claims that the justification for the selection process being declared void is that the FIA has broken Articles 81 and 82 of the European Treaty which are at the core of competition law. "[The] FIA in said selection process restricted competition and conduct against the competition rules contained in Articles 81 and 82 of the Treaty," claims the letter. These competition rules prevent restrictive practices which "limit or control production, markets, technical development, or investment." The rules add that "any agreements or decisions prohibited pursuant to this article shall be automatically void," hence Stefanovic's demand. All the EC would say about the case is "we can confirm we have received the complaint." The risk that the EC could declare the selection process invalid may alone be enough to derail the plans of Manor, Campos and US F1, since they are in the process of raising the millions of dollars needed to compete in F1. Any question mark over their participation could weaken their chances because backers would be less likely to commit. FOTA bosses give some cost cutting insight.